As presented by their owners, Katie Fitzgerald’s is ‘’the best music venue in town’’. Located in an historic building dating back to the 19th century it provides music events and recording facilities to music aficionados from Stourbridge, UK. With many activities going on in their busy venue, digitalsignage.NET allowed them to create a focus point for all the news and information they wanted to share with their clients. Open Mic nights, Quiz nights and various bands that they work with are promoted on screens in key locations across the venue. Using our software, Katie Fitzgerald’s owners can display different messages on different screens, and schedule those based on the time of the day and day of the week to give their communications a note of immediacy and relevance. 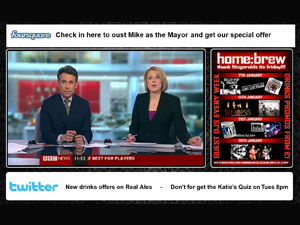 The scheduling feature within digitalsignage.NET, along with its advanced layout feature allowed Katie Fitzgerald’s to use the screens to sell advertising space to other local businesses and generate extra- revenue for themselves. As digitalsignage.NET is a cloud- based software, its use as well as the setup of the entire system which was carried out by Chamber TV involved minimum costs in terms of hardware and infrastructure. This has also removed the need for specialist IT staff at Katie Fitzgerald’s, allowing it to focus on what it does best: offer good quality music in a relaxed environment. This entry was posted in and tagged digital signage, digital signage for hospitality, digital signage software, retail digital signage by Dynamax. Bookmark the permalink.